LASER-TRAK EAR PLUGS, disposable, multi-colored, 100 pair per box. MAX-LITE EAR PLUGS, NRR30, low pressure foam, 200 pair per box. EAR PLUGS, Howard Leight, LASER-LITE with cords, NRR32, multi-colored, 100 pair per box. EAR PLUGS, Howard Leight, LASER-LITE without cords, NRR32, multi-colored, 200 pair per box. For basic hearing protection – are lightweight and durable, with soft sealing cushions and a unique cup design for good sound level reduction. 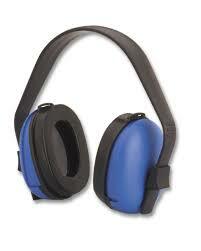 Headband earmuffs have a Noise Reduction Rating of 23 dB (NRR23), when used as directed. * Fire 101: How Does It Work?